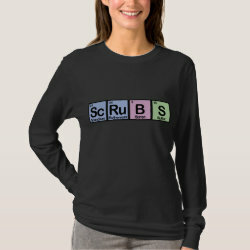 This fun design is the word SCRUBS spelled out using elements of the periodic table. Each letter or pair of letters is shown in a colored square, making this a cheerful, colorful design. A fun gift idea for anyone who wears scrubs as part of their work.